Kristin over at Twinkle Twinkle has chosen Purple with bling, glitz and or glitter for this weeks challenge. As you know, if you follow me, I have been making altered canvases, so this week I did one for the challenge. 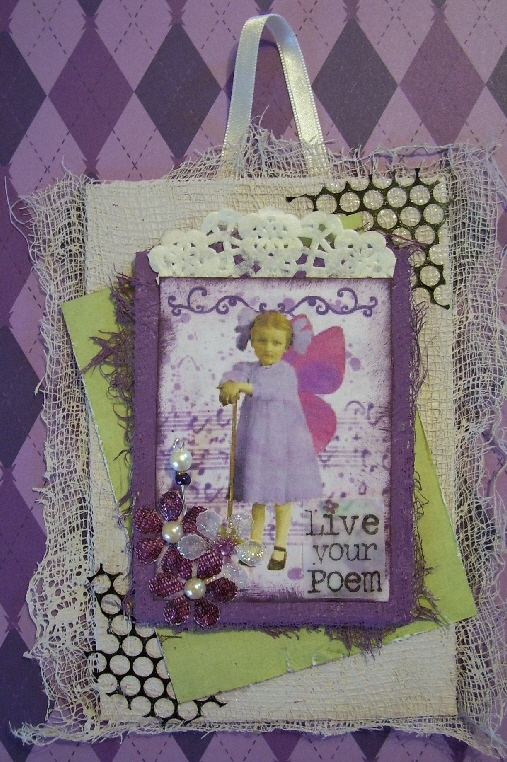 I was going to make greeting cards and I do have a purple card but I am not submitting it for this challenge. The canvas was too much fun. I enhanced an image in Gimp and made a purple background. I covered the main canvas with cheesecloth then painted it with Ice Storm Violet acrylic paint. I had a purple paper picked out as well but the flip side was green and I wanted to break up the purple a bit so I opted for that instead. Then I painted the smaller canvas piece with some cheesecloth on it with Pansy Lavender. Added some sequin waste, doily, and my bling is the Stickles I applied to my flowers in the bottom LH corner. I also have a handmade stickpin with a purple bead but you may have to click on the image to see more details. Now to catch up on every one's creations from this weeks Summer of Colour Purple creations. 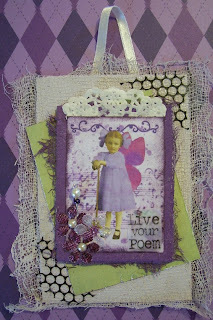 I love purple and am loving this weeks projects! oh, so many layers. Love it. I also love the sequin waste, and the words! Really nice! lovely canvas and love the shot of lime greem to break up the purple,. So many yummy layers here.. It looks amazing..
Love it Les.. that lime green is perfect... too pretty.. This is just beautiful, I love how you have created the layers and the colours are gorgeous. Thanks for coming and leaving me a fabulous comment - I really appreciated it.